In the constantly evolving world we are living in, fully sized bikes often just don’t seem like the most practical piece of equipment anymore. The designs of folding bikes have advanced in leaps and bounds because of people’s desire to have something more efficient and compact. These bikes have so many benefits, such as their ability to be brought into spaces that a normal bike just wouldn’t be able to fit into, and the fact that they are much more portable that a fully sized bike. They’re also much more complicated to design, and are more financially and time consuming to produce. These bikes can be priced at thousands of dollars, and though they are hugely beneficial and desirable, many people are not willing to spend this money. 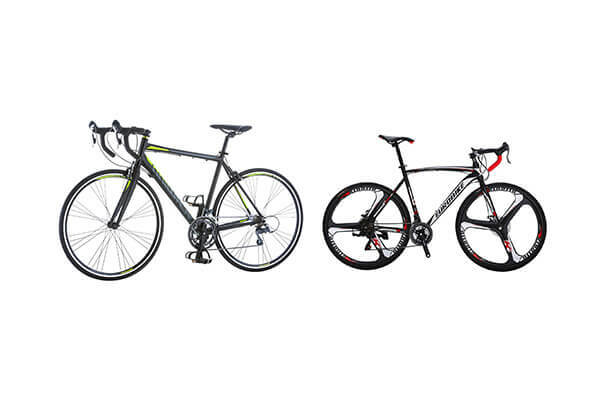 We’ve produced a list of more reasonably priced bikes, and you won’t find a single bike here worth more than $500. Folding bikes, somewhat obviously, are bikes that can be folded down with the intention of making them more portable. The overall goal is to create a bike that rides and functions just like a ‘normal’ bike, but with the benefit of being able to be folded down small enough to carry. Different companies have different mechanisms that make their bike foldable. Brompton have designed a unique folding method which is based on the wheels being able to pivot under the tube of the main frame, and the handlebar stem and seat stem collapse. Tern on the other hand have designed their bikes so that the main frame can be folded in half, allowing the bike to be folded up to a small size. These folding bikes are designed to fit in the trunk of your car, or a luggage rack on a train. 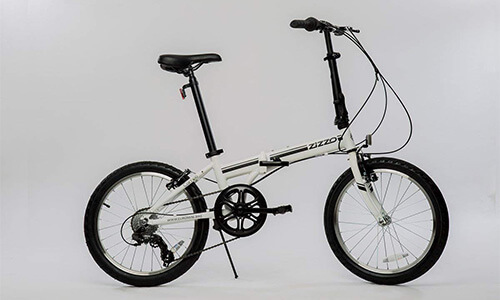 There are also different types of folding bikes, some being off-road and others being ideal for commutes or simple journeys. Off road bikes would potentially have more suspension and more durable tires, where commuters would have road tires and would be designed to be more compact and simple. One of the huge benefits of a folding bike is the convenience of it. The main appeal of folding bikes is the concept of being able to pack it down and take it anywhere – on holiday, to work, or to any bike riding location. This also means you’ll be able to store it easily if you’re short of space, such as living in a small apartment or when you’re at work. 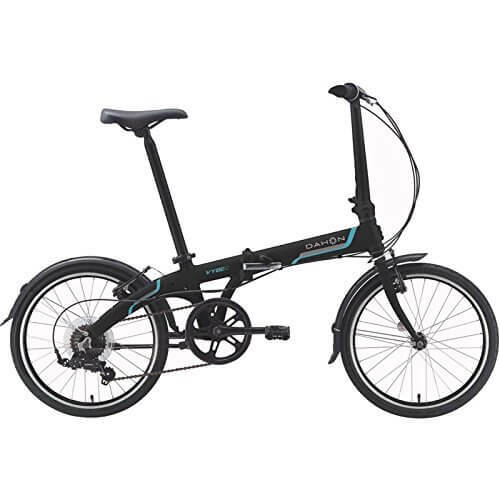 If this is a good folding bike, it’ll be fast and simple to unfold it and fold it at a moment’s notice, being no trouble at all to store or take out of storage. These bikes are also undeniably great for the environment. This point extends to normal bikes, not just folding bikes. If you switch out a car for a bike on your daily commute, your personal carbon footprint will be reduced massively. Furthermore, economically, you’re saving yourself the upfront cost of a car (or monthly finance costs), any money you’d pay monthly for gas, and maintenance costs. Another great benefit of folding bikes is the security and peace of mind it allows you. No matter what bike chains you buy, you’ll always risk theft by chaining it up on the street. A folding bike can easily be brought into work, and kept right under your desk. This applies to restaurants, cafés or anywhere else you plan to ride your bike to. This also means if you live somewhere that your normal bike can’t be brought into, you can now fold up your bike and sleep with the peace of mind that it’s safely inside your home. Often one of the first drawbacks pointed out is the wheel size. Folding bikes have smaller wheels (around 12 to 20”), mostly for the convenience of folding and transporting them, but this means that the bike isn’t as easily able to deal with uneven terrain or potholes. This problem can be partially solved by a folding mountain bike, however even then, often these folding mountain bikes won’t have wheels that are as beefy as normal mountain bikes’. The small wheels go hand in hand with restrictions on top speed. With each full wheel revolution, you’re not covering as much ground as a standard bike would, because of the smaller circumference. 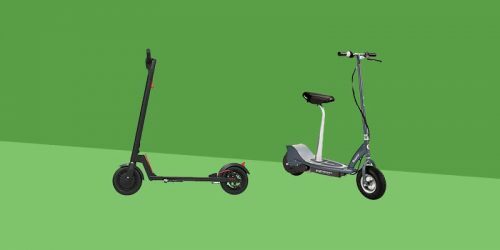 If you’re looking for a quicker option then a cheap road bike or even an electric folding bike might be more appropriate. 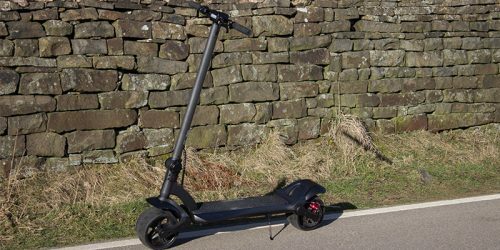 Folding bikes can often be recognised as a pricey piece of equipment, and they generally stand out from the crowd because of their unique design. This can lead to unwanted attention, and so I’d be aware that some people can be out to nab an item like yours, however you can be comforted by the fact that you can easily fold up your bike and take it indoors with you. Coming from the world leader and creator of some of the best folding bikes is the Vybe D7. Dahon has plenty of bikes to decide from, and down near the low price range is the D7, but that doesn’t mean they’ve cut corners with this design. This is a lightweight aluminium bike at 26 lbs, with a 7-speed Shimano drivetrain. 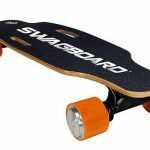 The wheels are 20” with aluminium rims, and the D7 comes in at an impressive 26.4” x 13.4” x 32.7” when folded, and feels sturdy and compact when picked up. The bike has a nice, sleek design, and will probably turn a few folding-bike-enthusiasts’ heads as you ride past. Overall the D7 is a comfortable ride and folds easily and efficiently. It is pretty lightweight, so ideal for transporting it on and off public transport. One complaint is the seat could be more comfortable, as on initial rides it took a while to get used to the stiffness. This bike is great for a commute, the 7 gears allows you to weave in and out of traffic and tackle small hills, and it perfectly fit underneath my desk. 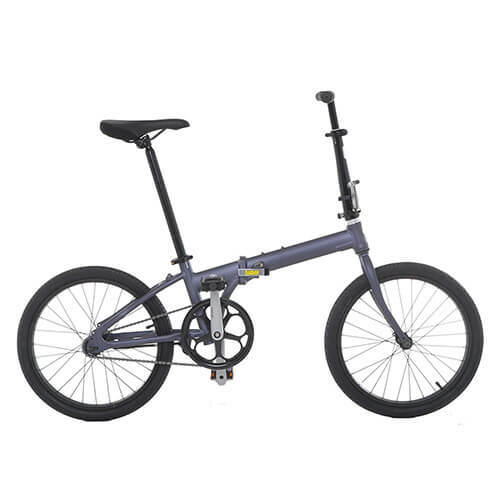 It is very popular among those who want a cheap, high quality folding bike. This bike has a stripped-back design which works wonders for city commuters. The lack of derailleur gears not only makes the ride simpler and removes complications in general, but also means less maintenance and potential money spent on fixing any problems down the line with gears and sprockets. The folding system is one of the best we’ve seen, it is fast and the magnetic latching system holds the bike securely. 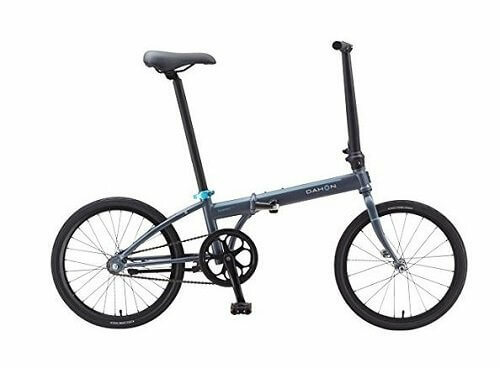 With nothing to maintain or fiddle with, the Dahon Speed Uno represents the simple bike ride many people crave. Schwinn are a well known company and have produced a large selection of bicycles, the Schwinn Loop being one of their few folding bikes. 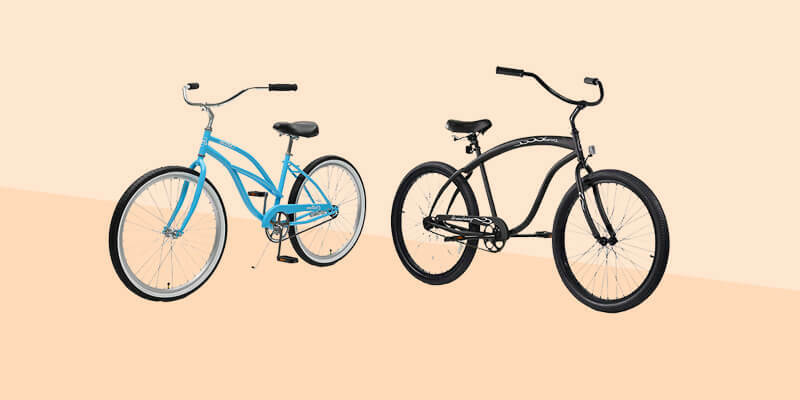 This bike is an adult commuter with a classic cruiser design to it; the aluminium frame sits low for easy access, it provides you with a rear rack for storage, and the seat is shock absorbing for extra comfort. 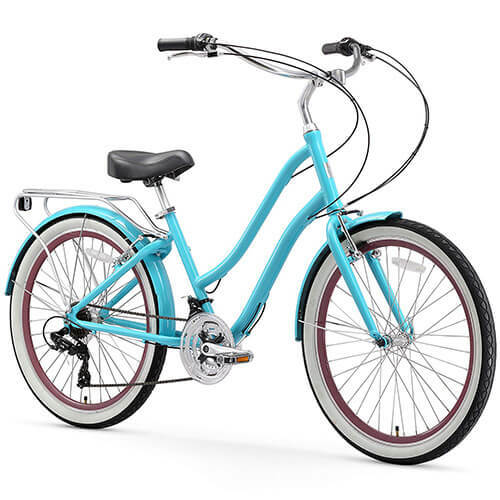 The Schwinn Loop folds to a size of 29.5” x 29” x 19”, and has 20” wheels. 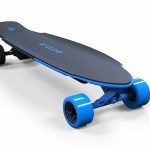 It has a respectable 7 speeds, enough for your commute to work, including any reasonable hill. The swept back handlebars are adjustable from 37” to 40”, which means the bike can accommodate a rider up to around 6 feet tall. Folding the Schwinn Loop is not the most effortless motion, and once folded it is unable to be rolled on one wheel like other folding bikes. Riding this bike was very enjoyable, the overall design of the Loop adds to the feel of the ride, such as the helpful rear rack and the large fenders. I would definitely recommend this bike for a commute or a ride that isn’t massively strenuous, as the gears are helpful but won’t take you up a steep gradient or off-road effectively. 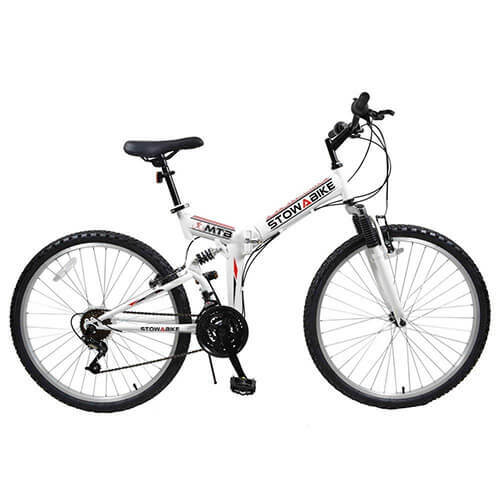 The low price, build quality and aesthetic of this bike are very attractive, and the bike will come with a carry case included. 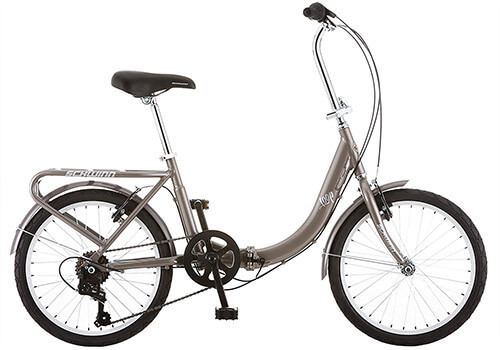 The EuroMini ZiZZO Campo is a modern looking bike with 20 x 2” off-road tires and an aluminium alloy frame. It comes with front and rear V-brakes, which are ideal for off-road rides, and aluminium rims. EuroMini have equipped the Campo with a Shimano 7-speed shifter, and has a max weight capacity of 240 lbs. The bike weighs 28 lbs, and its folding size is 27” x 31” x 12.5″, which can be folded down extremely quickly, it took me just over 30 seconds. The bike arrives practically fully assembled, with only one pedal needing to be installed. When riding the bike I found the braking to be responsive and strong, and the shifting was fluid. It’ll be able to get you up a short hill with no problems, and I personally love how thick the tires are. Once folded it can be packed away quite easily, and folds down to a small size, however it is not the smallest folding bike out there. Height wise I felt very comfortable, and Campo has an adjustable stem which allows the the maximum recommended height to be 6’3”. 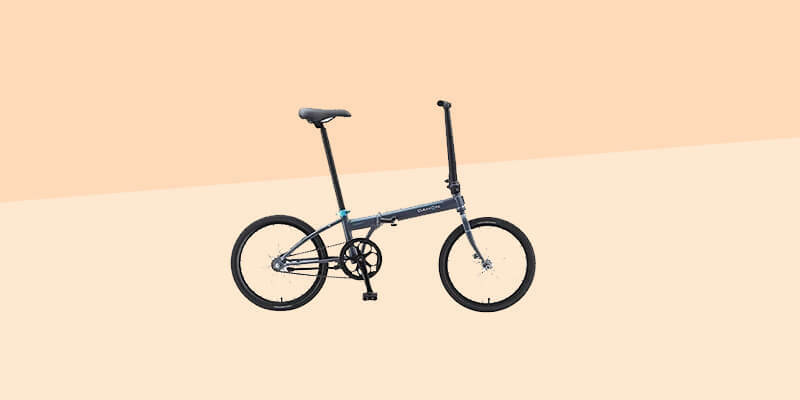 This bike is noticeably larger than the other folding bikes on this list, which is down to the fact that it’s a folding mountain bike. Stowabike have produced a comfortable mountain bike with 26” Wanda tires and 18 speeds – 3 shifters on the left and 6 shifters on the right. The Stowabike comes with a 26″ cast steel folding frame, and a 26” suspension steel fork, it also provides dual suspension, which is a must with mountain bikes. As most mountain bikes do, the MTB V2 offers v-brakes, meaning you’ll get a lot of stopping power. 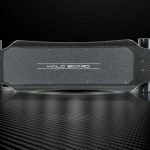 The handlebars are steel with black rubber grips, and it has dimensions of: 67.3” x 23.2” x 55.1” and when folded: 38.2” x 12.6” x 29.5”. 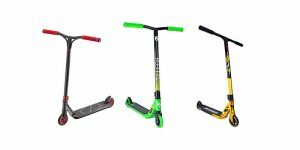 Stowabike are definitely on the rise, they’re becoming increasingly popular and with good reason. The bike managed to switch seamlessly between all 18 gears, and though the suspension isn’t as good as a fully fledged mountain bike’s, it worked well off-road. This bike is on the heavier side, and took slightly longer than previous bikes to fold, however that’s nothing to complain about. Though some aspects of the MTB V2 can’t beat a standard mountain bike, this is a great option for a cheap foldable mountain bike, and I definitely wouldn’t overlook it just because of the low price. Moving on from our 18 speed, is the Vilano Urbana single speed. This is a lightweight aluminium bike with a coaster brake, and comes in at 21.5 lbs. 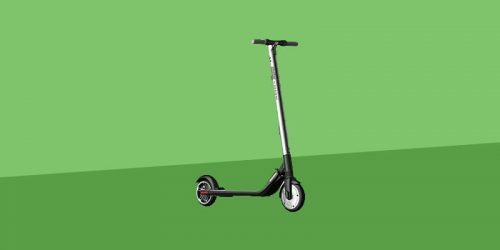 The wheels are a solid 20” and the weight limit is 200 lbs, although I’ve read reviews of people weighing upwards of 220 lbs riding this bike. This bike is minimalist and as a result, relatively cheap. There’s no gears, no cables and no brakes – you have to backpedal to stop. It has folded dimensions of 12″ x 32″ x 25″. This bike is perfect for city life, its lightweight frame and intentional lack of features makes it not only simple to ride but easy to transport. It folds quickly and smoothly, and is extremely easy to pick up and carry, and the folded dimensions means it doesn’t take up a huge amount of space if you’re on a busy bus or train. It’s also very cheap, coming in at less than any other folding bike on the list. So if you’re looking for a minimalist bargain then this might be just perfect for you. Folding bikes suit many different lifestyles and bring varying benefits to them, but you can say that the most glaringly obvious benefit is the portability of them. 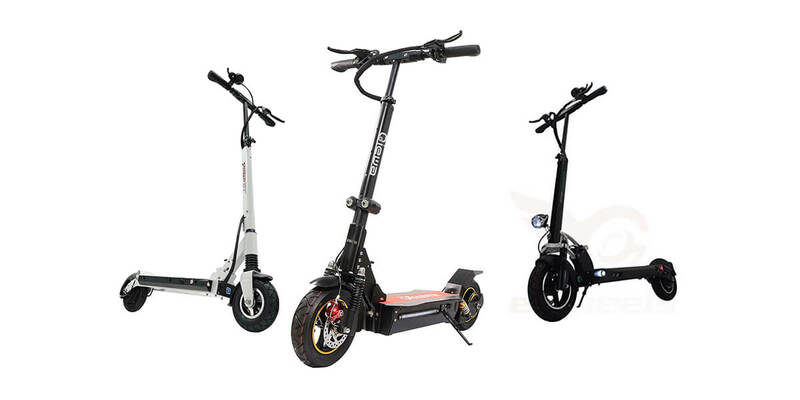 These bikes can easily be stored in cars, public transport, offices and cafes. This type of bike gives you more freedom and can easily become an extension of your lifestyle. Many people might completely overlook the possibility of owning a folding bike, maybe because they prefer their car, or because they think they can’t afford one, and we’ve written this list just as much for those who are on the fence about bikes in general as those who are already in love with their normal bike and want more options when it comes to cycling. Of course, we are not saying these bikes are cheap, far from it, but if you had any assumptions that a good folding bike has to costs thousands of dollars, hopefully this list has opened your eyes to the number of great, budget folding bikes!